Samantha graduated from the University of Calgary in December 2014 with a BSc in Geology with a focus on hydrogeology related courses. 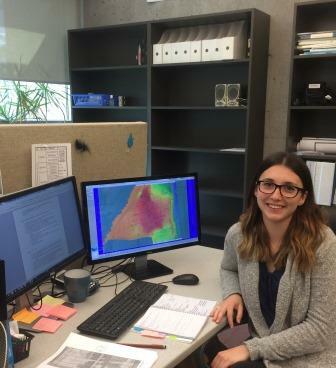 In the last summer of her undergraduate degree she gained invaluable experience working as a Hydrology Research Assistant at the University of Calgary. During this time Samantha also completed an Undergraduate Student Research Project through an NSERC scholarship that involved a comprehensive hydrogeological study of the Glenbow Ranch Provincial Park in Cochrane, AB. She also implemented a long-term hydrological monitoring program in the park that is still operational today. Samantha began her MSc at Simon Fraser University in January 2016 under the supervision of Dr. Diana Allen in the Groundwater Resources Research Group (GRRG) in the Earth Sciences Department. She is excited about pursuing her MSc degree in such an interesting and dynamic field of study and looks forward to the knowledge and experience she will gain. Outside of academics, Samantha is an avid soccer fan and player, and have been playing high-level competitive soccer her whole life. Northeast BC has seen a boom in shale gas development over the last 15 years. In order to access the gas in the tight shale units, industry hydraulically fractures the rock to increase its permeability. Fracking requires large volumes of water, with a single well requiring 15,000-20,000 m3 of water to complete. Currently, most of the water used for hydraulic fracturing in Northeast BC is surface water; however, increased development may increase the demand for other water sources, specifically groundwater. Several paleovalleys have been identified in Northeast BC. These paleovalleys are filled with Quaternary successions of both coarse and fine-grained material. Coarse-grained sediments such as sands and gravels throughout these paleovalley fills have the potential to store and transmit significant quantities of groundwater, and as such have been termed “buried valley aquifers”. My research will investigate the role that buried valley aquifers play in the regional hydrogeologic regime of the Peace River region in Northeast BC. Using a combination of geological and geophysical data I will construct a 3-D geological model of these buried valley aquifers using Petrel. The geological model will then be used to develop a 3-D numerical groundwater flow model that can be used to explore the potential hydraulic connectivity at a regional scale, as well as possibly a local scale. Simulations will be carried out to quantify the regional water balance, thereby furthering our understanding of groundwater resources in the Peace River region. This work aims to extend the research conducted by Geoscience BC and the BC Government to assess the available water resources in Northeast British Columbia, and is being supported by a grant from the Pacific Institute for Climate Solutions (PICS).